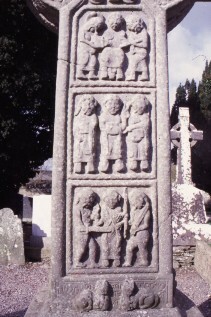 This is a a close up view of the west face of the cross shaft of Muiredach's Cross at Monasterboice, Co. Louth. W1 Arrest of Jesus. Harbison suggests both the Second Mocking of Jesus and Ecce Rex Iudaeorum (Harbison, 1992, p.143).